Men bathe underneath the construction of a new bridge linking Haijipur and Sonepur over the Gandak River, a tributary that feeds into the Ganges River in the same area. The construction of new bridges is a common sight on the Ganges River as India expands and links cities that were once separated by the river. This bridge, located in the Bihar Province of eastern India, serves multiple roles for the needs of people who live along it: bathing, a source of water for cooking and transportation. As the Ganges progresses through highly populated cities, the role it plays transforms from spiritual to necessity. 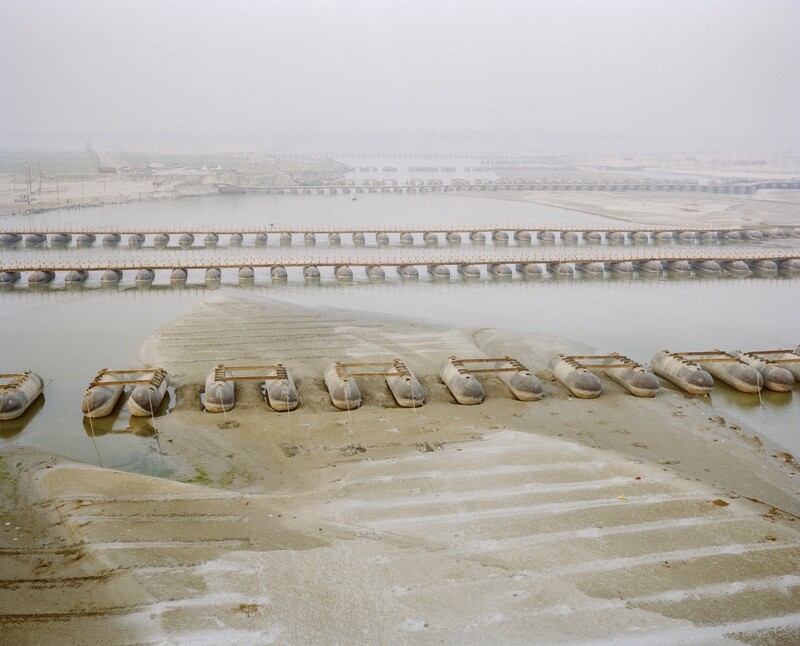 A landscape view of the confluence of the Ganges and Yamuna rivers in the holy city of Allahabad, India, where massive pontoons were used to create temporary bridges for pilgrims during the Kumbh Mela, a religious gathering that saw over 30 million people gather at the banks of the Ganges and Yamuna rivers in March 2013 to bathe and pray. 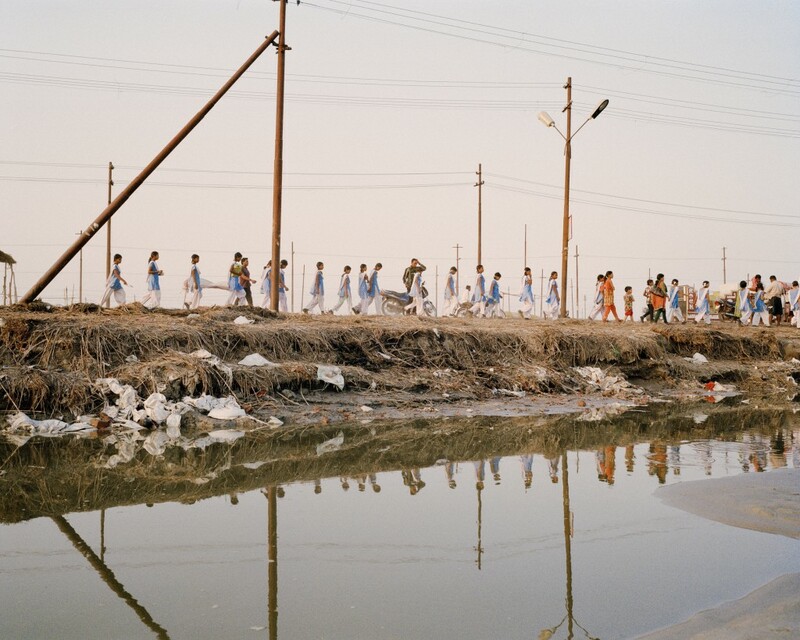 Girls from the K. Gandhi School in Farrukhabad arrive at the confluence of the Ganges and Yamuna rivers in the holy city of Allahabad, India. The city was the site of the Kumbh Mela religious gathering that saw over 30 million people gather at the banks of the Ganges and Yamuna rivers in March 2013 to bathe and pray. The aftermath of hosting such a large event has left the land around the sangam, or meeting point, replete with trash. Mustafah Abdulaziz (b. 1986, New York City) is a documentary photographer based in Berlin, Germany. His on-going project “Water” has received support from the United Nations, WaterAid and VSCO, has been reviewed by Phaidon, Monopol and published in Der Spiegel, The New Yorker, Telegraph Magazine and The Guardian. His prints are represented by Milk Gallery in New York City. His archive is represented by Ostkreuz Agency in Germany. Mustafah is a member of the MJR photo collective. Mustafah Abdulaziz was chosen by photographer Adreinne Grunwald. Laatikkomo’s interview with Mustafah Abdulaziz, October 13th, 2014. L: Where are you from? What cities, and/or countries have you lived in – or what places/cultures have influenced you? MA: I’m from New York City, USA. The landscape of America, particularly the Midwest and Northeast, in it’s diversity and scale, has been defining for me. The sense of something greater than yourself, the expanse, a world unseen. L: What is your earliest memory of water? MA: I’m not sure. Maybe summer rain storms in New York. L: Your project on Water is an estimated six-year venture in several “chapters”. Is there a reason you chose to confine this project within six years? Could the project eventually be completed in less or more time? MA: The timeline for Water is based off trying to structure something very big into something possible. It is very well it will go on afterwards for me, but I see the timeline as lengthening or shortening depending on funding and how the chapters come together. L: How has your extensive project on water scarcity changed how and/or what you photograph? MA: Yes. The last few years I’ve spent more time researching how to link these issues, planning the trips and creating collaborations that allow me creative control for steering the project in the heading it needs to go. In a very basic sense, I photograph slower and with more of a mind towards connectivity and relativity. The project has always been about more than water scarcity. It’s fundamentally about our interaction with water, what we’re doing with it and what that means for our collective future. L: Parts of your other (older) series are also taken within the context of water. What is your personal relationship to water and how has it changed, or has it, as a result of focusing so exclusively on water? MA: I find it to be a remarkable thing. In my work before Water, it represented different things: a canvas or maybe a place to project myself into. Now it is more about the relevancy of water as a theme of concern, how other people might see it or need it or interact with it. I first saw it in the context of myself and now I see it in others. L: Having spent extended periods of time in areas affected by water pollution and water scarcity, you have both a somewhat inside and an outside perspective. What political resolutions do you see as necessary in order to improve or at least protect water for the future? MA: That is a good question. People far more qualified than myself are working to solve these questions. At risk of over-simplifying, I will say there needs to be an acceptance of water as a human right in the political regard, and a major shift in our paradigm towards this “us and nature” mentality, because ultimately we are not separate from nature. We are all a part of this wonderfully complex and critical system that supports our existence, we are responsible for it and for each other, and this needs to be valued. Water is not concerned with international boundaries. If we can take more steps to see water as unifying, then I think there are many, many answers that become logical in this regard. L: Your images are very beautiful (composition, light, technique) even though they deal with very difficult subjects. Do you think this beauty has the power to pull outside viewers closer to the reality of life with water scarcity or might it push that reality into a non-tangible story for those who have not had to live without water? MA: Art has the power to pull people into realities. Theatre, film, photography; the way in which I respond to these things is often intangible, where a story, visual or atmosphere trigger emotions that I am not in control of. This is a starting point for me to question, to remember or imagine. Beauty can be a catalyst for this. It is also a double-edged sword and can block people from understanding. The balance is what I seek in my own work because it is what I respond to personally. L: Photography holds a lot of power, especially when dealing with documentary photography. There is always some amount of manipulation involved in photography, even if it is simply in how the image is cropped. What are your thoughts on deliberate manipulation of documentary images for the good of any specific cause? MA: If by the manipulation of images you mean passing off something as true that is false, or more accurately, masking or adding things to an image that the photographer knows to be otherwise, for ulterior reasons, then this is a problem of respect. Photography is subjective, in my view, from where you stand to make a photograph or what aesthetics and visual language you use to communicate and so on. But in this regard, it is markedly different when one seeks to extend subjectivity into the desire to deceive. I’m not interested in photography that is without respect. There are so many reasons to distrust visuals right now, brought on by so much over-proliferation, perhaps, that to treat your subjects and viewers with such contempt is a sign of a deep lacking and insecurity. There is such potential for photography to transcend itself, to call forth really beautiful things in a person and their observations of the world, that I can’t help but view work based on,. and using, duplicitous manipulation with disappointment and pity. Without respect towards oneself, towards the people they portray or the viewers who bring themselves to the work, then the craft of photography is reduced to a common parlour trick. MA: Scale, rhythm, atmosphere, heart and soul, procession. Thank you so much Mustafah! We wish you luck with grants supporting the continuation of this project!